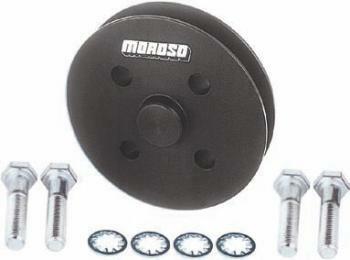 Moroso Pulleys UNIVERSAL - Lesher Motorsports, Inc. Fits: Chevrolet V8 and 90º V6 with OEM crank pulley (GM #3858533), also fits some inline Chevy 6’s. Moroso Radius Tooth Alternator Pulley is designed to work more efficiently and take less power to drive. Moroso Radius Tooth Alternator Pulley is made to use a .500” wide drive belt, and with a wide variety of drive pulley sizes, any drive ratio you may need is achievable. This pulley is made to accept a .590” diameter shaft alternator.